Report highlights need for new approaches to injecting drug use in Dublin. Seminar and report launch highlights need for new approaches to respond to injecting drug use in Dublin City Centre for the benefit of drug users and the wider community. Mr. Alex White,TD, Minister of State for Primary Care formally launched the seminar “A Safer City for All – addressing the risks of injecting drug use” organised by Merchants Quay Ireland (MQI) and Ana Liffey Drug Project (ALDP) at MQI’s Riverbank centre, today 28th May 2013. 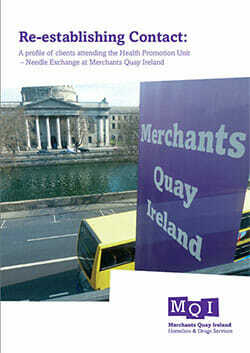 The seminar included the launch of a report by MQI on the experiences of 388 people who use their Needle Programme. Speaking at the launch Tony Geoghegan CEO of Merchants Quay Ireland said “the report confirms people are still using heroin, but polydrug use is now the dominant trend. This means detox services in Ireland have to match the need. In Ireland there are currently no detox options for this group. Furthermore the report shows a critical need for testing for Hep C and other Blood borne viruses (BBVs) in this at risk group to improve individual health through appropriate treatment but also to reduce the spread of the these diseases. Tony Duffin, Director at Ana Liffey Drug Project, commenting on the main findings of the report, stated “Of particular interest to me is the finding that 14% of the people surveyed reported generally using in public areas. Ana Liffey is committed to exploring innovative models to address these concerns”. This seminar comes from a specific recommendation from the report “A Better City for All” launched last year, commissioned by representatives of Dublin City Council and a range of community, voluntary and statutory groups. Speakers at the event include Neil Hunt and research lead Ciaran Jennings.